MACU faculty and students welcome the public to join in poignant reflection on the Lenten season and prepare for Easter through scripture readings, sacred music, and a homily by campus pastor Johnny Bland. This Holy Week Worship Service will be Tuesday, March 31, beginning at 7 PM in the MACU Chapel, (located at 3500 SW 119th Street, Oklahoma City). 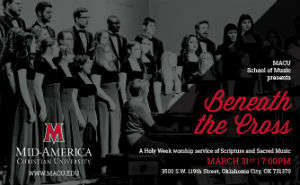 For more information, contact MACU School of Music, (405) 691-3800 or www.MACU.edu. Mid-America Christian University offers a Christian liberal arts education through two dynamic colleges. The College of Arts and Sciences (CAS) offers undergraduate degrees to traditional residential and daytime commuting students at the main campus in Oklahoma City. The College of Adult and Graduate Studies (CAGS) makes college education affordable and accessible to busy working adults and graduate students. Degree programs are offered online and convenient evening classes at the main campus, and through the north OKC location. MACU is an endorsed agency of the Church of God (Anderson, IN), and is regionally accredited by the Higher Learning Commission of the North Central Association of Colleges and Schools (NCA; http://www.ncahlc.org). Visit www.MACU.edu for more information. This entry was posted in All Church of God, Central, Colleges & Universities and tagged Easter, Holy Week, Johnny Bland, MACU, Mid-America Christian University, Oklahoma City, worship. Bookmark the permalink.